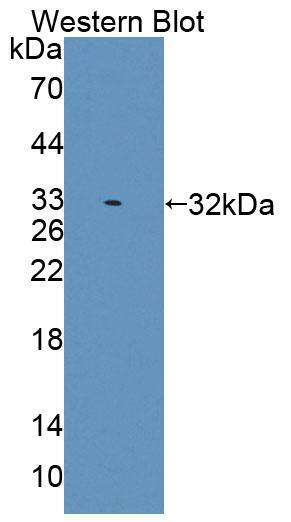 The antibody is a rabbit polyclonal antibody raised against ABAT. 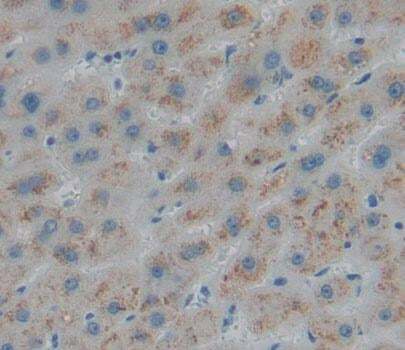 It has been selected for its ability to recognize ABAT in immunohistochemical staining and western blotting. Supplied as solution form in PBS, pH7.4, Containing 0.02% NaN3, 50% glycerol. Content: The quality control contains recombinant ABAT (Pro249~Lys500) disposed in loading buffer. Loading Buffer: 100mM Tris(pH8.8), 2% SDS, 200mM NaCl, 50% glycerol,BPB 0.01%, NaN3 0.02%. Store at 4 degree C for frequent use. Stored at -20 degree C in a manual defrost freezer for one year without detectable loss of activity. Avoid repeated freeze-thaw cycles. Small volumes of anti-ABAT antibody vial(s) may occasionally become entrapped in the seal of the product vial during shipment and storage. If necessary, briefly centrifuge the vial on a tabletop centrifuge to dislodge any liquid in the container`s cap. Certain products may require to ship with dry ice and additional dry ice fee may apply. 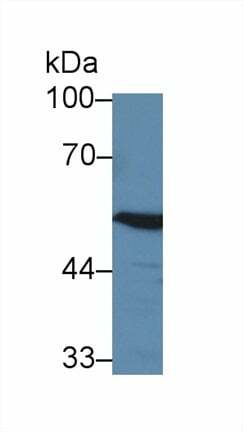 Western Blot: Sample: Recombinant protein. NCBI/Uniprot data below describe general gene information for ABAT. It may not necessarily be applicable to this product. ABAT: Catalyzes the conversion of gamma-aminobutyrate and L- beta-aminoisobutyrate to succinate semialdehyde and methylmalonate semialdehyde, respectively. Can also convert delta-aminovalerate and beta-alanine. Defects in ABAT are a cause of GABA transaminase deficiency (GABATD). The phenotype of this deficiency includes psychomotor retardation, hypotonia, hyperreflexia, lethargy, refractory seizures, and EEG abnormalities. Belongs to the class-III pyridoxal-phosphate-dependent aminotransferase family. 1. This study utilized ER+ IBC to identify a metagene including ABAT and STC2 as predictive biomarkers for endocrine therapy resistance.